"Are you out of your mind old man? You woke me up without donuts, made me come over here to find a rust bucket crushed beneath a truck and some blue chalk dust. Now you say back to bed....I think not!! " "Well you others are letting Yensid treat you like puppets on a string... do what you want....None of you were ever meant to lead anyway. As for me I will be prowling the park in search of a certain...well I'll keep that to myself for now." Si and Am decide to go back to the Boardwalk, they had left some cream in the lounge and were ready for a cat nap. They headed into the the small store there wondering if they had cream. They knocked some racks over, but didn't find anything. Thirsty they headed out and quickly arrived at the lounge, but the cream was gone. Annoyed, they headed toward the kitchen area, where the finally found the cream. After a quick meal, they headed toward their room and curled up and were asleep in seconds. When the blue chalk dust was found, Vidia wondered how it could be associated with the killer. "Hmmm, what does blue chalk dust have to do with the murderer?" she thought to herself. "I certainly can't find any connections with the person I thought was guilty..."
And with that, she began to think through all of the possible murderers. "Man, I can't wait to find this killer," she said to herself as she flew out of attraction, ready to get some sleep. Diablo ponders his theory as he flies back to the hotel alone. The blue chalk dust fits in... But what if he's missing something? He knows he's never truly understood humans, after all. He decides he'd better sleep on it. Watching the scene unfold around her, Marie was shocked that the lion spoke to Yen Sid that way. She, too, was exhausted, but a lady would never be so rude to the team leader! Shaking her head, Marie heads back to the hotel. She was really looking forward to a long, peaceful rest. Belle was sadly taking in the scene of their departed detective when Mater appeared and gave them a clue of the killer. While Belle could not make much sense of it in comparison with the other clues, it was a clue nonetheless and she recorded it in her notes. Yen Sid suggested for everyone to go back to their rooms and get some sleep and Belle couldn't agree more. She looked over at Scar rambling some rant toward Yen Sid and announcing he would be prowling around the park on his own for the killer. "Have at it," Belle remarked to Scar as she rolled her eyes. "I'm not going to be so foolhardy to 'prowl' around for a manic killer half asleep. I'll be a well rested 'puppet'." And with that, she headed back to the hotel. When the group gets up to leave, Abu collects Carpet and follows along. Lost in thoughts of bananas and plush pillows, Abu barely registers the group's arrival at Test Track. He's certainly not surprised to see a ghost detective appear. Abu decides to fly through Mater a few times just for fun. The others wrap up the scene and bored still, Abu has Carpet fly off to see if anything interesting is happening elsewhere at Epcot. The duo head in the direction of Mission Space. After Yensid bagged up the blue chalk dust, he suggested that the detectives head back to their rooms and try to get some sleep. After the initial excitement, Vanellope did realize that she was getting very tired. If she was going to be any use tomorrow she had better get some sleep. She snicked to herself when she heard what Scar said to Yensid. That overgrown feline sure doesn't know when to keep his mouth shut. She also certainly wasn't going to walk around at night looking for the killer. Not when she was this tired anyways. Vanellope heads back to her room, curls up in bed and falls asleep. *Cue Music...DOOFENSHMIRTZ EVIL INCORPORATED*~Dr Doof finally arrives at Test Track..."I have arrived with my Inat...."..but his announcement is cut short by several detectives pushing their way through the doors as the leave. Lying on his back from the stampede he mumbles..."Whhhh..at haa..pp.ened?" Marie yelped when the sea witch tripped over her. With a huff, she fluffs her fur and straightens out her bow. She sticks her nose and tail in the air, trying to appear as tall as possible. As she walks out, she sees the silliest of the humans laying on his back. "You were late." *Cue Music.....DOOFENSHMIRTZ EVIL INCORPORATED*"LATE?? Late for what?....Nice Kitty...late for what? You know your much nicer than big old scary kitty. You know I once had a pet...well he wasnâ€˜t really a pet...or even an animal. ...he was a balloon. His name was balloony and he was my best friend....ok...ok..my only friend. But one windy day he left me and I havenâ€˜t seen him since. Now my brother Roger had all kinds of pets but I wasnt allowed to play with them." Not finding anything interesting in the Mission Space area of Epcot seeing as the playground area was closed. Abu has Carpet head over to the other side of the large globe. Seeing some lights on, they fly closer and see several cast members tending various plants. One especially catches his eyes. Abu chatters at Carpet and Carpet flies down to ground level where Abu hops off. Sprinting inside, Abu shimmies up the nearest tree and a grab a bunch of bananas. He then leaps down and scampers as fast as he can back to Carpet. Just as he reaches Carpet he hears someone yell, "Stop Thief"! Not bothering to turn around to look, Abu jumps back onto Carpet and they zoom off into the night. Marie thought it was amusing that the scientist referred to her as a nice kitty. She had never heard that phrase before. But her amusement was soon replaced with shock when he seemed to refer to her as a pet. "I'm very sorry that your ballon -friend, rather- has left you," she began, "but I am not a pet. In fact, I am a lady," she finished proudly. Marie didn't want to mention that she thought having a balloon for a friend was very strange. Si and Am woke slowly. The extended their front legs and stretched from the tip of their claws to the end of their tail. Vidia woke up the next morning. She had some crazy dreams last night. Shaking them off, she carefully stretched her wings and her arms, preparing for the day ahead. She had pondered more about the recent deaths and clues. "Is that blue chalk dust really chalk dust?" she asked herself. "It probably is... I mean, how do you confuse blue chalk dust for something?" She continued to think more on the matter as she flew downstairs to get ready for breakfast and meet with the other detectives. Marie had slept soundly, curled up in a tight ball. When she first woke, she groggily peeked out over her tail. She then gathered up the energy to stand and stretch, before fixing her bows. She thought she heard some of the other detectives heading down to the lounge, and her rumbling stomach told her that it would be a good idea for her to go down too. Jim awoke from yet another restless sleep, filled with many dreams. He dreamed of many of his suspects yet when he awoke he felt no closer to determining who the killer was than ever. Surprisingly, despite everything going on Jim found himself feeling famished, and so he wandered down to the lounge to find something to eat. Vanellope woke up from a sound sleep, feeling refreshed. She was still a bit groggy because she didn't get that much sleep, but she did feel much better. She could hear some of the other detectives heading downstairs. She guessed they were getting some breakfast. I better go get some too, she thought, hearing her stomach growl. Vanellope crawls out of bed, grabs her clue notebook and heads downstairs towards the others. It grew lighter out as Si and Am finished their meal. All that frozen cream was making them cold. They started back toward the boardwalk carefully avoiding the sand areas. They went from beach chair to beach chair, knocking them over as they went. When they finally made it to the lounge, they noticed the breakfast buffet had been set up. "an omelet station", started Si, "let's check it out" finished Am. There was a bowl of fresh shrimp at the station. They each speared a shrimp with a claw and started breakfast right on the buffet. After messily eating their fill, they settled into the warm comfy chair for a bath followed by a cat nap. 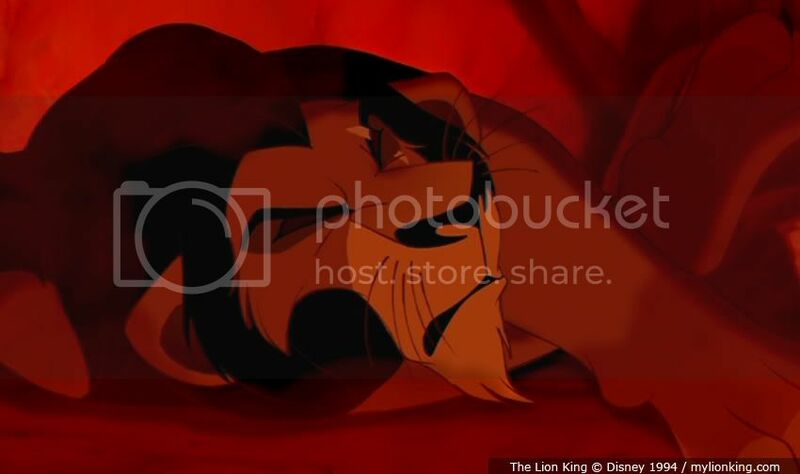 SCAR:"Hola Amigo...I really could have used that salsa fifteen minutes ago. Salsa and duck....now that is a great combination." "Hello dear....yes goodmorning to you too......Yes I agree that is a very good idea....Ok I will meat you at the lab and between us we can ...how do you say...persuade those two idiots for some answers. Oh but one more thing love.....no goodmorning smoochies....my breath is ...welll... a little fowl."